Here are some of the newly discovered Lego Star Wars: The Force Awakens glitches and solutions. Note that these Lego Star Wars: The Force Awakens glitches can of course get patched by the developer Traveller’s Tales at any time. But you might encounter the here-under listed glitches for yourself in the meantime. During the Story Mode, you might accidentally not save your progress if you quit the game without waiting for the on-screen saving icon to disappear after level completion. Similarly your progress does not get saved automatically during a level, which means if you exit a level without using the “Save & Exit” pause menu option you’ll lose your progress. This isn’t really a glitch caused by the game — outside of the fact that the developers should have had more regular mid-level auto-saves in this game instead of just one at the end of the level — but it still seems to happen to a lot of people. Hence it was worth pointing out to always save your progress before you exit the game or turn off your console, computer or handheld. How To Fix Glitches: Download the latest patch for Lego Star Wars: The Force Awakens, the developer will use patches/updates to try and fix the most common glitches in this PC, PS4, PS3, Xbox One, Xbox 360 & Wii U title. Whereas the required install size for the main game is 15.31GB, the Day 1 patch takes up another 2.1GB of your harddrive space. For a patch to be that big, it implies significant bug fixes have been made. Here’s the list of changes that will be implemented on Day One. An update contains changes that are permanently stored on your system and only needs to be downloaded once. 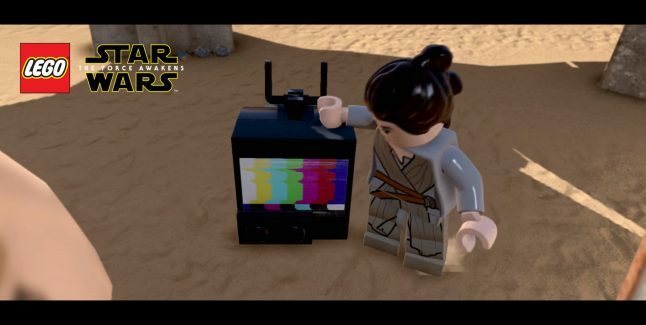 You can download the latest update by launching Lego Star Wars: The Force Awakens while connected to PlayStation Network, Xbox Live, Nintendo Online or Steam. You will be prompted to install the update (when you start up the game) if you do not already have the latest version. If while you’re playing Lego Star Wars: The Force Awakens on PC you’re experiencing lower than ideal frames per second (FPS) or even stuttering gameplay, you should first check if your system can handle the game. Screen Tearing Glitch on D’Qar Hub: There’s an issue on consoles like the PlayStation 4 where there’s lots of screen tearing and framerate drops in the D’Qar hub area once all the collectibles (and quests) show up everywhere. The glitch especially happens when you’re walking inside buildings. The solution to get the screen tearing on D’Qar to stop is to find and pick up all the collectibles that seem to be the cause of the stuttering slowdown & screen tearing, because the sheer amount of collectibles is too taxing for the console on this open world hub. Have you encountered any Lego Star Wars: The Force Awakens glitches?